Day 2 in Singapore started in much the same way as Day 1 in Singapore, at about 3:00 AM when my body clock, adjusted by an 8-hour time shift, decided it was morning and I should jolly well be awake. I spent the next four hours lying on top of the bed under that most tropical of housing icons, a ceiling fan, wondering how long the next half hour would feel. Such are the joys of long-distance travel. Finally, when everyone else was awake and sorted out, our host, David, decided to take us for one of his initiation tours of downtown Singapore; he’s qualified tourist guide here so is a great person to have around. Unfortunately, it seemed that at least half the entire tourist population of South-east Asia had begun their mornings with the same thought. First of all, we were forced to make three circuits of the Padang before finding a parking spot, where David has never before had trouble. Pedestrian walkways across bridges were blocked by hoards of (largely Japanese) tourists pointing their (largely Japanese) cameras at various Singaporean landmarks. We’d headed for the now well known Merlion which was also frequently obscured by people who think an iPad makes a suitable American replacement to Japanese cameras. All iPads, of course, must be held higher, away from the face, for large amounts of time while Mr. Bozo squints at it’s highly reflective screen wondering if the correct tourist attraction is actually in view. Added to all this, the sky was in one of its completely white moods and all such photographs are crap, anyway, whatever they are taken on. 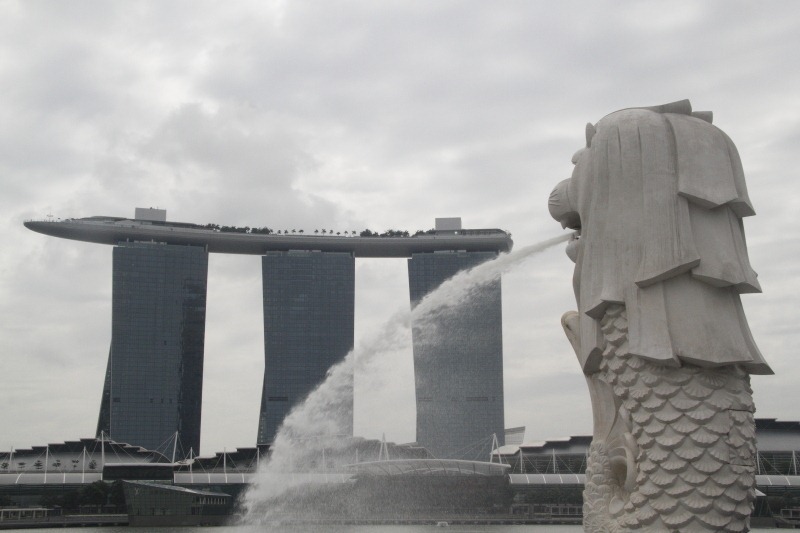 Above right is a shot of the aforementioned Merlion, a strange blend of fish and lion, with a slightly stranger building topped by a bent boat in the distance, to show what I mean. Curious! (There are some advantages of height – you can get above heads and iPads. To get anything half-way reasonable on pixels in this light, it’s necessary to cut the sky out and capture more low-level subjects. 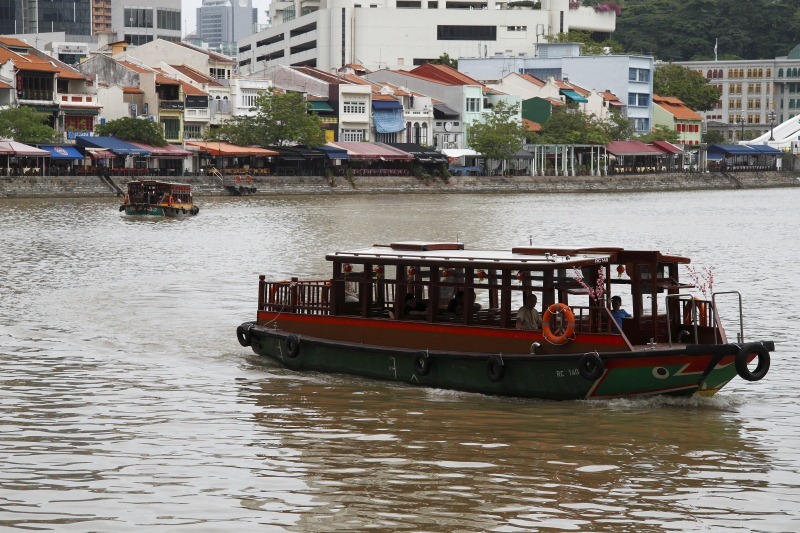 Here’s a couple, both to do with the Singapore River. One shows a couple of so-called bumboats doing what bumboats do before a colourful old River frontage now composed of bars and restaurants. 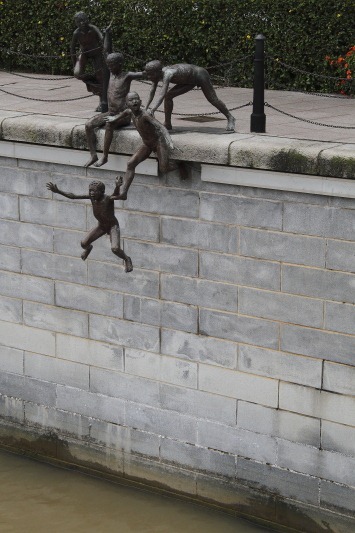 The other is a charming statue – I don’t usually appreciate “art” – depicting five children using the river as a playground (or should that be playwater?). After a disappointing lunch of over-cooked tuna in a tuna burger (the tuna was thick enough, how did they manage that?) at one of the restaurants above, we zoomed off to leave the crowds for the peace and serenity of one of Singapore’s many parks and garden, in this case Kent Ridge Park or KRP, as it is inevitably known by the TLA-loving Singaporeans. Things looked bad to begin with, the park appearing to be closed off by building barricades, but there was still pedestrian access so all was well. 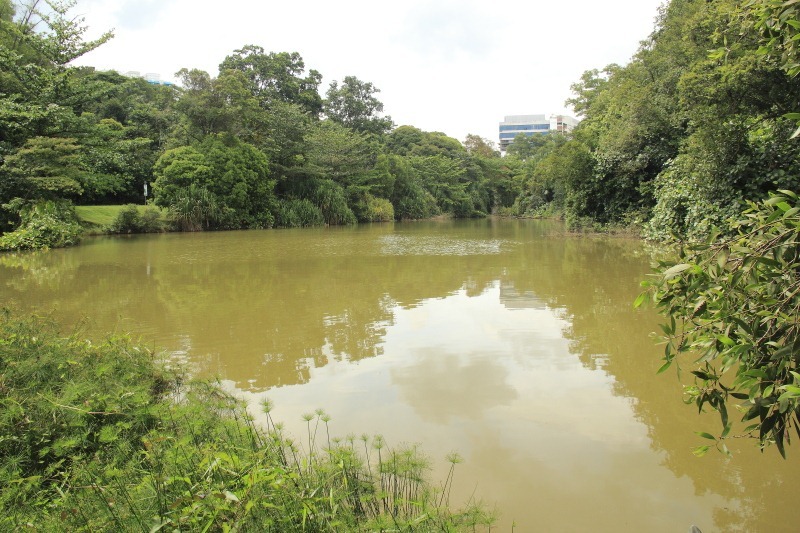 There are two good dragonfly ponds here, both being much more natural habitats than the manicured ponds of the SBG (Singapore Botanic Gardens). Life was much more peaceful and harmonious; instead of the seething hoards downtown, here we spotted only a handful of other humans. There were more dragonflies, I’m pleased to say. 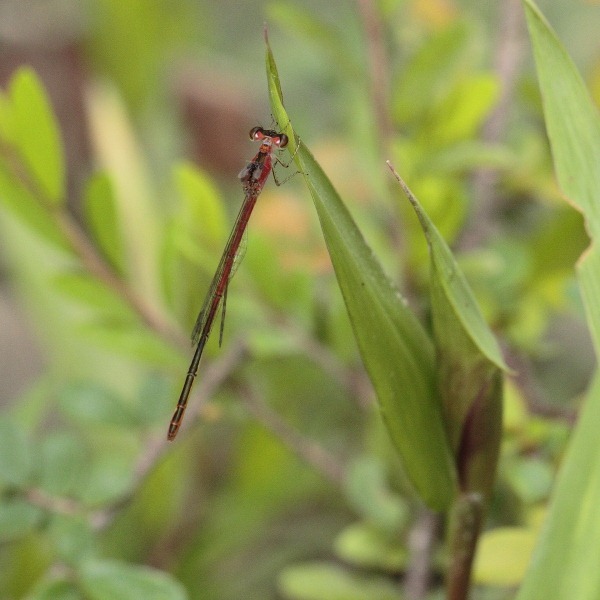 The most intriguing was the tiniest damselfly we’ve ever encountered, called (we think) a Variable Wisp (Agriocnemis femina). This delightful little critter is a mere 20-ish millimetres long, less than one inch. The poor thing appears to be infested by a couple of even smaller flies, too. To get home, we were to get to grips with another of Singapore’s favourite TLAs, the MRT [Mass Rapid Transit] system. After a steamy walk to the station we tried to buy two tickets to Kembangan only to have our S$10 note rejected by the machine. After much head-scratching we finally figured out that S$5 was the largest it would accept. Duh! Having changed our note, we also had to change trains once and made it back safely.